I admit that I’m a carnivore from way back. I’ve been a serious meat eater for most of my life, and I’ve always justified my meat-loving ways by thinking that my body requires animal protein. However, I’m turning over a new leaf in 2015, and rethinking the types of protein that I consume. Now I’m not saying that I’m giving up meat (I don’t think that’ll ever happen), but there are so many other great sources of protein that are satisfying and delicious. I’ve been on a little bit of a cashew binge the last few weeks, enjoying the nut form of protein. I’m snacking on nuts and seeds and introducing more beans into our everyday meals. My local farmer’s market stocks shelves and shelves of every kind of dried beans you can imagine, so last weekend I grabbed some organic red lentils in hopes of making a hearty soup. I learned something new today. Have you ever heard of a pulse? And I’m not talking about the kind that you feel in your wrist. Lentils are a type of pulse. According to Wikipedia, a pulse, sometimes referred to as a “grain legume”, yields from one to twelve seeds of variable size, shape, and color within a pod. Dry beans such as pinto beans, kidney beans, navy beans, dry peas, and lentils all fall into this category of legumes. Who knew? This lentil soup that I’m featuring today is completely vegetarian and gluten free. Onions, carrots, celery, tomatoes, and vegetable stock form the base of this soup, and I seasoned it with cumin, coriander, and turmeric. Being the southern boy that I am, I threw in some collards for color, texture, and extra nutrition. This hearty and filling soup makes a completely satisfying meal with no meat required. 1. Heat olive oil in a large Dutch oven or soup pot over medium high heat. Saute carrots, celery, and onion for 4 to 5 minutes. Add garlic and continue sauteing for 4 to 5 minutes until vegetables are tender. 2. Add tomatoes, stock, water, lentils, cumin, coriander, turmeric, salt, and pepper. Bring to boil, reduce heat, cover and simmer for 25 minutes until lentils are tender. Add collards and continue simmering for 5 minutes. Remove from heat and adjust salt and pepper to taste. Serve immediately. I love lentils. You name the pulse, I am up for it. They are a staple in Italian cookery, and so I use them often. Red lentils are indeed delicious, but if you ever come across the lentils grown in Umbria and Le Marche in Italy, grab some. You will not be disappointed. This soup sounds terrific – just the thing to get your new year off to a healthy start! Bill – this looks amazing! Might have to try it this weekend. I don’t think I’ve ever met a pulse or legume that I didn’t like! And red lentils are wonderful. And they pair with greens so well, don’t they? Terrific soup — thanks. 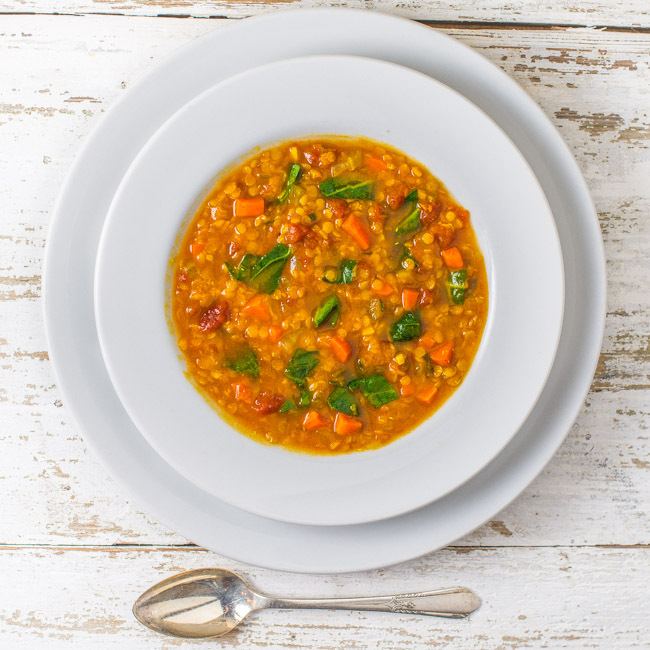 I love lentil soup, this just looks so comforting, hearty and delicious. Thanks for the recipe – you definitely can consider I will be trying it! This soup looks so soul satisfying. I love it! Oh yeah, this sounds amazing. I love all these ingredients.